Health Do Your Fingers Wrinkle In Water? THIS Is What It Means! The body is an amazing thing. It’s complex, intricate and fascinating. Every second of the day, our bodies work to keep us healthy and safe. A simple action, such as a yawn or a sneeze, is often the body’s way of protecting us from harm. Have you ever wondered why you get the hiccups, or why your fingers wrinkle in water? Two words: defense mechanism! You’ve probably experienced “raisin fingers” at least once in your lifetime. 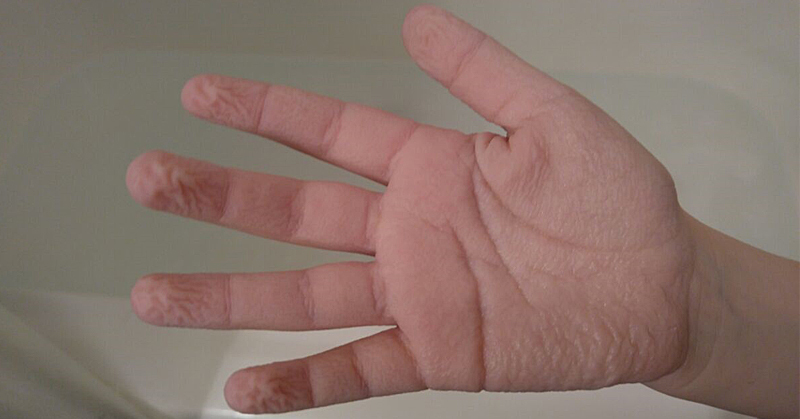 You may have soaked in the tub just a little too long and ended up with wrinkly fingers when you finally got out. Have you ever wondered why that happens? It turns out those wrinkles have a specific purpose. When the body encounters an increased amount of moisture, it realizes that the outside environment might be slippery. In response, the skin on your hands begins to wrinkle, to help you get a better grip on smooth surfaces. Pretty cool right? Check out some of the body’s other defense mechanisms. You’ve probably heard that a yawn means that you’re tired. That’s partly true. It means that your brain is tired. The purpose of yawning is to cool down the brain after it’s been overheated or overloaded. It starts with a little tickle of the nose, then a big AAAHHCHOO! When the nasal passages fill up with too many allergens, microbes, dust or other irritants, the body signals a sneeze. When you sneeze, you body is clearing your airway of any irritants. You might have a habit of stretching when you wake up in the morning. Stretching upon waking is an instinct. It prepares the body for the day by working the muscles and restoring blood flow after a long night’s rest. It also improves your mood! Hiccups are the worst! But they happen for a reason. When you eat too quickly, swallow large pieces of food or overeat, the pneumogastric nerve becomes irritated. This nerve is closely connected to the stomach and diaphragm. The irritation results in hiccups. Memory loss often occurs after an unpleasant experience. If an event left you upset or hurt, the brain might delete it from your memory to prevent it from being brought up again. You’ve probably experienced goosebumps on a chilly day, when you forgot to bring a sweater or a jacket. Goosebumps help to reduce the amount of heat the body loses through the skin. When you’re cold, goosebumps help keep you warm! Scientists believe that in a stressful situation, the body creates a new source of irritation – tears – in order to distract you from the pain you’re experiencing. Tears also act as protection for the mucous membrane of the eye when foreign object come into contact with it.